White-tailed deer feeding habits shape the acoustic properties of their forest habitat, potentially affecting the vocal communication of understory-dwelling songbirds and other species, according to a study published February 13, 2019 in the open-access journal PLOS ONE by Timothy J. Boycott from Vassar College and colleagues. 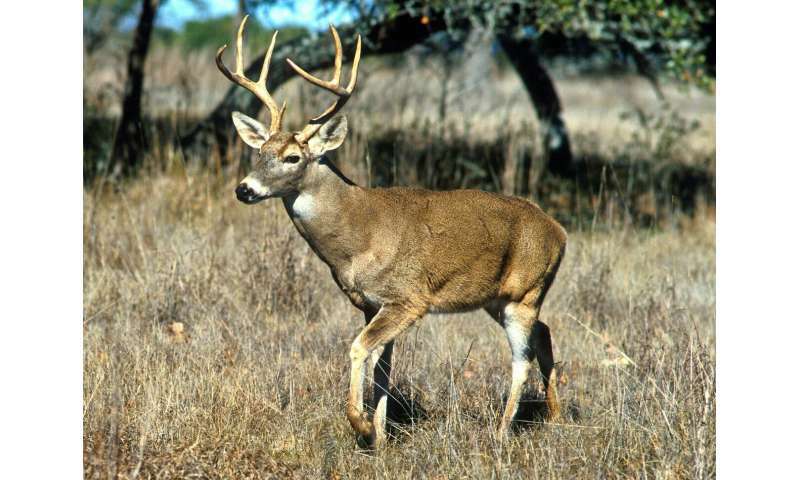 White-tailed deer (Odocoileus virginianus) populations are on the rise throughout North America. Their feeding habits (browsing) directly shape their forest habitat—primarily by reducing the abundance and diversity of understory shrubs and trees. Heavily-forested areas tend to reverberate and scatter sound more easily than open space, and thus the sound transmission is a crucial component of communication for species including songbirds. To determine the effect of deer browsing on sound transmission, the researchers played recorded sounds representing songbird tones and trills, as well as white noise, in paired plots that were either fenced off to exclude deer or left open to deer as normal. To compare acoustic differences between the plots, the authors examined the fidelity, amplitude, and attenuation of the sounds across the plots. The deer-browsed plots had significantly greater sound fidelity than the deer-excluded plots, though there was no significant difference in amplitude, which the authors attributed to the reduced density of understory vegetation in the deer-browsed plots. The finding suggests that songbird vocalizations might be more effective and transmit information more clearly, to both intended receivers and unintended receivers such as predators, in deer-browsed environments. This study examined sound transmission over distances of 11m or less so future studies examining songbird vocalizations across longer distances and with different levels of deer browsing may be needed. Nonetheless, these results suggest that white-tailed deer browsing in forests could have acoustic as well as ecological effects. Gall adds: "While we know quite a lot about the effects of deer browsing on vegetation and we know quite a lot about the effects of vegetation on sound propagation, the two had never been linked. Here we're looking beyond traditional deer browsing ecology and asking how deer might be influencing the communication space for animals."